The CCD/CMOS sensor of a digital camera reacts similarly to slide film. If the sensor receives too much light the highlights become burned out and contain no detail, often referred to as blown highlights. Too little light and the image is rendered as black, again containing no detail. The human eye can distinguish highlight and shadow detail in a scene across a dynamic range of approximately 9-10 stops, whereas negatives are able to record detail across approximately 7 stops. Digital cameras on the other hand have a dynamic range of approximately 5 stops, similar to slide film. For example, if the exposure reading from the shadows was f/5.6 and the highlights reading was f/22 then this represents a dynamic range of 4 stops between the two extremes and a digital camera would be able to the record detail in this scene and thus produce a recognisable image. Although a digital camera’s LCD screen allows you to review your images instantly it is ineffective for determining whether you have achieved an accurate exposure simply by looking at the image. Not only is the screen too small but its brightness alters depending on which angle you view it from. However, the LCD screen can be utilised to show flashing (blown out) highlights and more importantly histograms. A histogram is a graphical representation of the distribution of the pixels contained within a digitised image. It not only shows you whether the pixels are located within the shadow, mid-tone or highlight regions but also how many pixels are present in those various areas. There is no such thing as a correct exposure. It is always a compromise. For example, you can get the exposure accurate for the highlights and consequently sacrifice shadow detail or vice versa. With the aid of the histogram you will be able to determine whether you have under, over or “accurately” exposed your image. 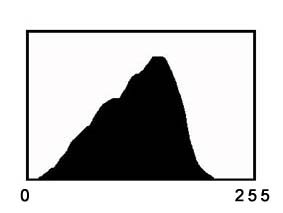 The horizontal axis on a histogram represents the brightness levels of the image, ranging from pure black (0) at the left to pure white (255) at the right. It should be noted however that the human eye can detect no noticeable colour or texture in shadow values of 0-20 or highlight values of 250-255. The vertical axis represents the amount of the image that is located within the various regions. RGB histogram: This is a composite of the tonal values for the three colour channels (red, green and blue). 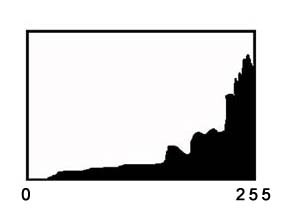 This histogram allows you to see whether you have pixels at the “bookends” (0 and 255). Brightness/luminance histogram: This is similar to the RGB histogram except more bias is placed on green (as the human eye is more sensitive to this colour) then red and finally blue. It is because of this somewhat unbalanced averaging that the brightness histogram does not always show if pixels are present at the “bookends”. As more emphasis is placed on green, the brightness histogram and the individual green channel of the RGB histogram are similar. This brightness histogram provides the best representation of the brightness and contrast of your image. The histogram is a powerful tool. Learning to interpret it is essential. Increasing number of pixels as we move towards the middle portion (mid-tones) of the histogram with the peak slightly biased towards the right-hand side, followed by a corresponding decrease in numbers as we move to the right. Of course this is only a guide. As always there are exceptions. For example, with a night-time shot you would expect the pixel distribution to be biased towards the left-hand side of the histogram. 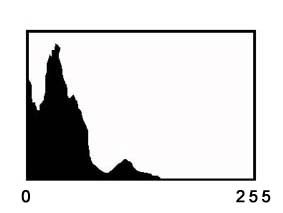 In the case of a silhouette the vast majority of the pixels would be present at the extreme ends of the histogram. The only way to learn is to experiment with the camera and look at the histogram each time. Practice makes perfect. Please bare in mind that the above examples are illustrated using luminance histograms. The wide range of colours that we see every day are in fact composed of the three primary colours red, green and blue. It is possible that clipping could occur in one or more of the individual colour channels of the RGB histogram. If this clipping occurs in either the red or blue channels then it will not be shown in the luminance histogram (remember - the luminance histogram is in essence the same as the green channel histogram). Therefore if your camera allows you to view the individual channels of the RGB histogram it is advisable to utilise them to determine exposure accuracy.